HAVING spent the past 48 or so years not dying, I've sort of grown used to getting older and would like to continue doing so. Unfortunately on the road I'm surrounded by texting drivers, so it's just a matter of time before one of these mobile-pecking morons takes me out. Last week while driving to work I was slightly concerned to see a four-wheel drive roaring towards me while its driver gazed at his lap. Normally this wouldn't worry me but we were on a bridge and he was on my side of the road. Fortunately his passenger grabbed the wheel and steered around my skidding car, while the driver probably texted, "Nearly had a head-on! LOL!" I wondered if the passenger's underwear needed changing, because mine certainly did. The police are doing their best but they're outnumbered. 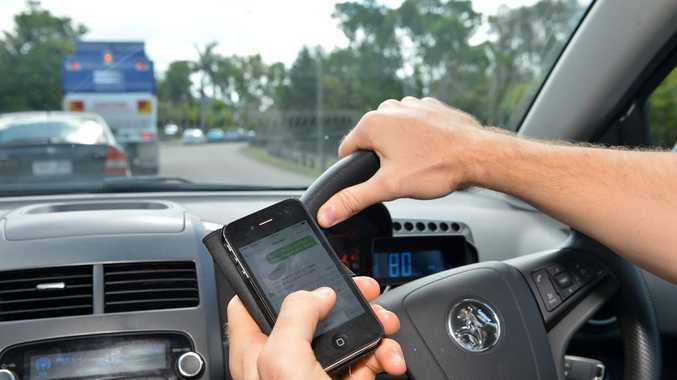 Perhaps if the cops started shooting these clowns, that might stop people from texting while driving - except for the hard-core text addicts, who would turn their phones round to video the executions. Fortunately I came across another solution quite by accident - someone else's actual accident. Puttering away from the prang, I flashed my lights at the oncoming traffic to warn them of the hazard ahead and every vehicle slowed down, even the ones being driven by remote control (i.e. drivers steering with their knees while texting). It was magical. Phones were instantly dropped and drivers became hyper-alert. Inspired, I continued flashing oncoming traffic long after it was necessary. The best bit was, everyone smiled and waved at me. So even though flashing is against the law, I'm going to keep doing it until I get caught. It's just a matter of time but at least it won't be by accident. Greg Bray blogs at http://www.gregbraywriter.wordpress.com. Find him on Facebook: Greg Bray - Writer.